thanks to Ray Evernham's love of old iron and his determination to save an important piece of racing history. as it roars past the pits at Fairground Speedway in Nashville. The legendary No. 777 Plymouth Belvedere raced by country music legend Marty Robbins returned to its Nashville roots the weekend of June1, 2013, fully restored to its yellow-and-purple glory by NASCAR championship crew chief, team owner and new host of "AmeriCarna" on Velocity, Ray Evernham. The No. 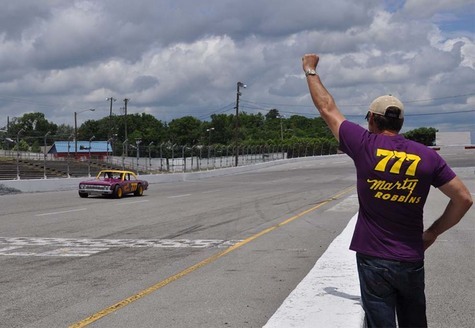 777 Plymouth Belvedere was unveiled on Friday, May 31, in downtown Nashville and returned to on track action on Saturday, June 1, at Fairground Speedway Nashville. It originally competed at Fairground Speedway Nashville in the late 1960s primarily in the Modified and Sportsman classes. Marty Robbins was an avid race car driver, competing in 35 career NASCAR races with six top 10 finishes, including the 1973 Firecracker 400. His best NASCAR finish was a fifth place at Michigan in the June 1974 Motorstate 400, only time he was ever on the leader board at the end of a Cup race. Robbins was partial to Dodges, and owned and raced Chargers and then a 1978 Dodge Magnum. His last race was in a Junior Johnson-built 1982 Buick Regal in the Atlanta Journal 500 on November 7, 1982, the month before he died. In 1983, NASCAR honored Robbins by naming the annual race at Nashville the Marty Robbins 420. Evernham worked on the restoration with Ronny Robbins, Marty Robbins' son, as well as Al Jones, Nashville racing historian. "Marty Robbins was such an icon for both the country music world and for NASCAR fans," said Ray Evernham. â€œWhen he was racing, he brought a whole new level of interest and style to the sport. Anyone who grew up as a race fan in the 60s, 70s and 80s remembers that purple-and-yellow race car. I've always been interested in this car and Marty Robbins legacy, so when I had a chance to get the car and restore it, it was a dream come true." For Ronny Robbins, shown at left at the wheel of the No. 777, seeing his father's race car restored to its former glory and taking it for a few laps at the Fairgrounds is the ultimate tribute. "It's an unbelievable feeling to see this car again," said Robbins. "It was one of the first cars I ever worked on and I got to see it race at lot in Nashville. To take that car for laps, and think that my father sat in that seat, held that steering wheel and mashed those pedals, is an incredible connection to him. I'm so proud of his legacy and what bringing this car back means to our family and to his fans." Evernham found the car from an article in Vintage Oval Racing, then tracked down the owner Al Jones in Nashville, TN. Jones had purchased the car in 2010 after searching for it since the 1980s. A car painter in Nashville actually tipped off Jones to the location in Murfreesboro, and when Jones arrived, he found it sitting in the bushes on its side, consisting mostly of rust and dirt. "I love old cars, and have wanted one of the Marty Robbins cars since the 80s," said Jones. "I was in the right place at the right time to get the car. It was meant to be. About the time I realized that I couldn't finish the project like it needed to be done, Ray appeared and wanted the car. I knew he would do a great job, and it was the right thing for Marty Robbins' legacy to get the car in the hands of a quality restorer. I was just the caretaker of the car for a few years, and I'm proud to have been a part of it." The restoration project, along with the unveiling and return to the Fairground Speedway Nashville will be featured on "AmeriCarna", a car culture television show hosted by Evernham with guidance from friend and mentor Rick Hendrick, the well-known auto dealer, champion racing team owner and car collector. They'll rely on their vast experience as "car guys" to take viewers back in time and introduce them to a period of history when the automobile heavily influenced American culture. "AmeriCarna" will tell behind-the-scenes stories of lost race cars, barn finds, speed secrets, Hollywood films, historical racetracks and other unique places. Along the way, Evernham and his guests will meet the cars and characters that have shaped and preserved this history -- from the Appalachian Moonshiners that helped build NASCAR, to the West Coast Hot Rodders and Woody Wagon surfers that defined California Cool. Click Here to see a short history of Marty's Racing Career! Ready to take her out. Ronny Robbins takes #777 out on the track. Just like the old days - 777 flies by the grandstands! What it looked like back in the day!